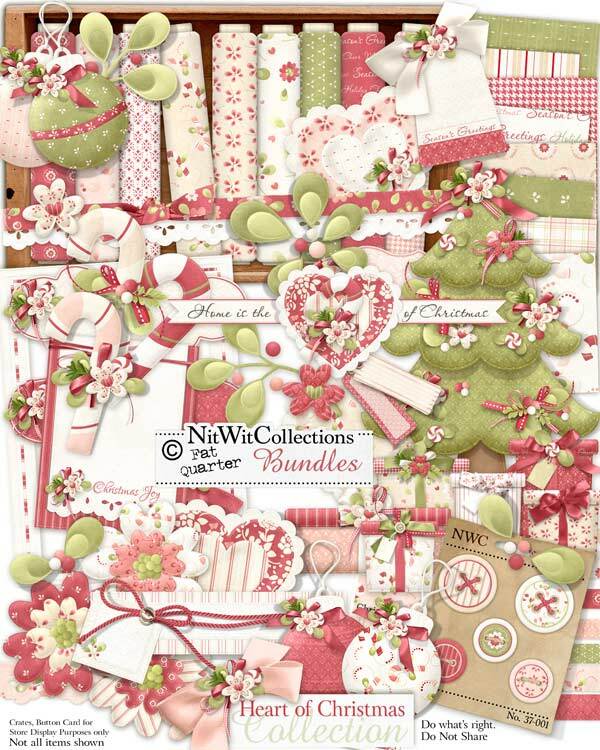 "Heart of Christmas" Collection really brings out the warmth, feeling and emotion of all that represents Christmas to us! Elements and papers that show off the intricate details in them, just like you put into your Christmas. A feeling of Christmases when they were hand made, treasured, and well done. Don't miss our Nitty Bitty "Season's Grrreetings" Mini Kit for a colour matched complimenting kit for your puppy pals. 1 Candycane plain - sometimes the greenery gets stuck in your teeth! 6 Gifts - don't they make you think of the olden days when the wrapping had as much thought and care as picking out the gift?! 3 Scallop Ribbons - LG thought I was talking potatoes?!! 1 Tag - "Season's Greetings"
1 Tag Topper - you really can't miss using this one! 1 Wordart - "Home is the Heart of Christmas"